Some years ago, when the restaurant Ixia opened on Charles Street, then-chef Edward Kim offered a dish he called a Sriracha chile bouillabaisse. A wonderfully spicy red seafood broth topped by a piece of crisply fried red snapper, the dish made such an impression on me that I recreated it at home. 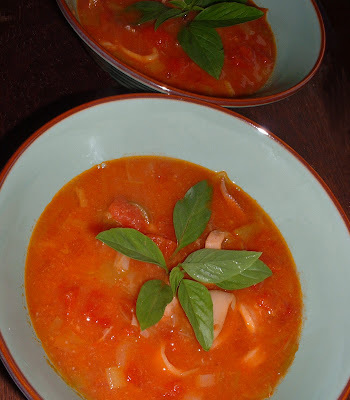 My version is pretty simple and needs only a handful of ingredients: canned tomatoes, onion, olive oil, fish stock or clam juice, and of course Sriracha. And some sort of seafood, of course. I've made it with and without snapper and decided that if there's enough protein in the broth, there's no need to go to the trouble of dirtying a sauté pan. Recently I made a version using only squid. While the popular Thai chile and garlic sauce called Sriracha is a main ingredient, the overall flavor of the dish was never particularly Asian. This time, I pulled the dish firmly into the Mediterranean by the use of sliced fennel, yet emphasizing the vegetable's licorice-y savor with a garnish of Thai basil. In a large soup pot or Dutch oven, heat olive oil and add leeks and fennel. Cook over medium heat until vegetables soften, about 12 minutes. Add garlic and stir, cook an additional minute or two. Raise heat and pour in lemoncello, bringing to a boil. After another two minutes, add tomatoes, clam juice, and water. When liquid comes to a boil, stir in Sriracha, red curry paste, paprika, and squid. Turn heat down and simmer for 90 minutes, until squid is very tender and broth has reduced somewhat. Stir in lime juice and add salt and pepper to taste. Garnish with Thai basil. Serve with crusty bread for mopping up the juices.